I was lucky to be a guest of the Herald Sun at its special event viewing of the Titanic exhibit last night, presented by promoter Michael Gudinski at the Melbourne Museum. It was interesting to hear Gudinski and the Herald & Weekly Times' Peter Blunden describe the huge success so far of this emotive exhibit. 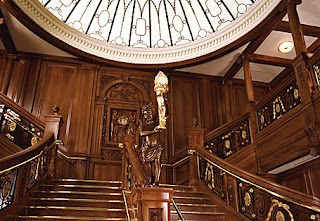 The reconstruction of the ship's Grand Staircase, a two-tonne chunk of the hull and a glacial wall that you can touch are some of the fascinating elements to experience. Spend a day at the marvellous, mesmerising Melbourne Museum with beaut dedicated volunteers and staff. Especially if you are going with children, it's worth watching The Titanic movie and Night at the Museum and Night at the Museum 2 to set the scene before your visit.